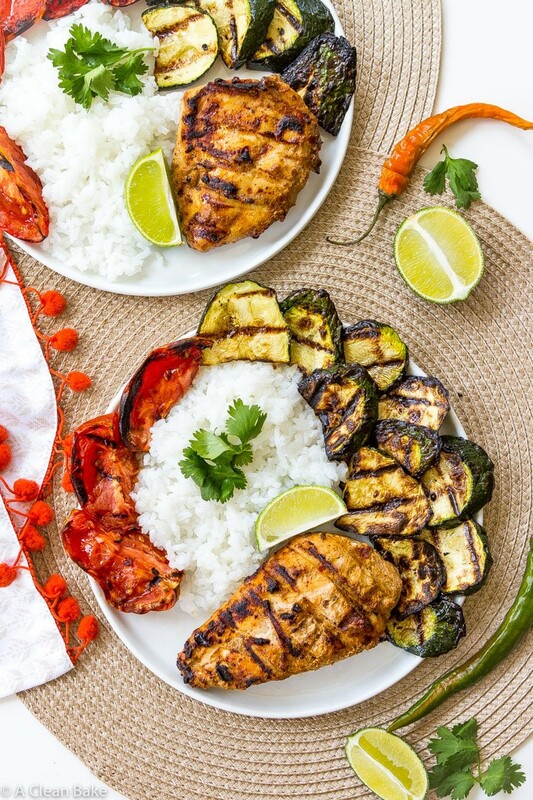 This clean eating tandoori chicken recipe proves that Indian food can be healthy, homemade and easy! Only three ingredients and minimal effort are required for this delicious dish. Since I strive for balance on this site, perhaps we should take a step back from chocolate decadence for a moment and focus on dinner. (In case you haven’t noticed, in my world, balance is defined as equal parts dinner and chocolate. What else is there?) And, with summer flying by, it’s long past time to fire up the grill. I don’t know what the heck I’ve been doing all summer, but I’ve only grilled two or three times so far and I just know that I’m going to really regret that in the dead of winter. So it’s time. Dinner tonight is brought to you by an open fire… or, well, a contained, gas fueled one on your back porch. Either way, it still results in a darn good meal of grilled tandoori chicken. Simply put, tandoori chicken is a chicken dish that is cooked in a tandoor, which is a (usually cylindrical) clay hearth oven used in Northern Indian cooking. (Similar ovens are found elsewhere in parts of Asia and the middle east, but I’m not sure if they are called by the same name.). The heat source is at the bottom, and the food cooks above it in crazy hot temperatures that can reach up to 900°F. Bread is baked by sticking discs of dough to the walls of the oven, where they quickly puff up as though on a super-hot griddle. Meat is typically dangled, on spits, from above. Imagine a bulbous umbrella stand with a cover. Now imagine that cover has little hooks underneath for long skewers of meat to attach to. (To the entire Indian nation: my sincerest apologies for the most crude and clumsy explanation of your wonderful tandoori cooking method 😬 ) If that meat is chicken, you have tandoori chicken. But there is more to Tandoori chicken than a tandoor. Though perhaps you could, technically speaking, call any chicken cooked in a tandoor “tandoori chicken”, the kind that is officially called Tandoori Chicken (as opposed to, say, chicken tikka, which is also cooked in a Tandoor) is marinated in yogurt and a fragrant spice mixture made from garam masala, garlic, ginger, cumin and other spices. The yogurt is an essential part of the dish because it imparts moisture and its mild acidity tenderizes the meat. 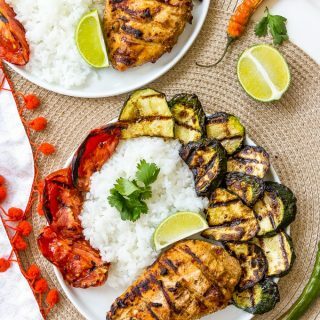 It is also a perfect way to dilute the otherwise-overpowering flavor of the tandoori paste , which is too strong on its own and, without the yogurt, would simply create a spicy crust (not in a good way) on the chicken. But those are the only ingredients: chicken breast, yogurt, and tandoori paste (also a splash of water, but who counts water?). I strongly suggest using chicken breast for this recipe, but if you can’t stand it and prefer thighs, give it a shot. 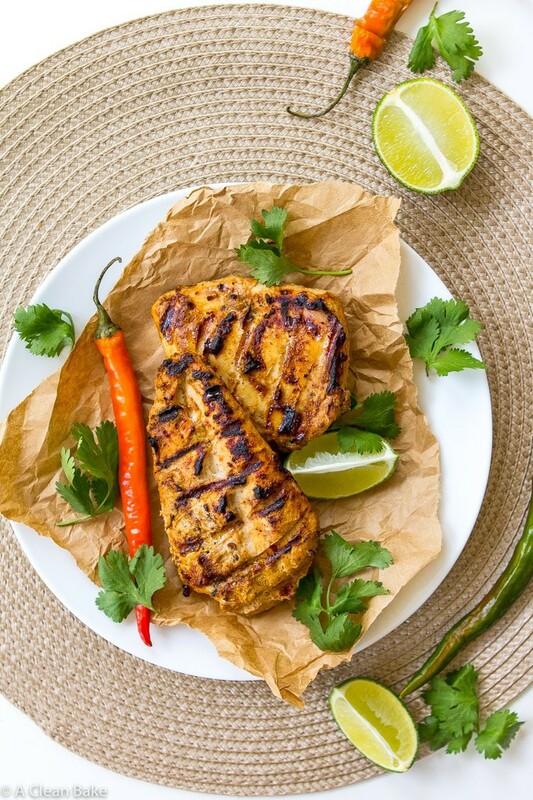 Chicken breast holds up well both to long-term marinating and to grilling and its leanness is well balanced by the tenderizing qualities of the yogurt. I used full fat Greek (lactose) yogurt when making this, but you can certainly try a non-dairy yogurt if you don’t tolerate dairy. This is my yogurt of choice. I prefer this brand because it is the only Greek yogurt on the market that is 100% strained, with no added thickening agents. In other words, it is made the traditional way and still contains only milk and live, active cultures (the fermentation agent). For the record, this is not sponsored in any way, and I’ve never worked with them here; I just genuinely love their product. That said, I know many of you do not tolerate dairy, so please feel free to try this with whatever plain (unflavored, not even vanilla) yogurt you do tolerate. You’ll also need to use a dairy free yogurt to make this dish Whole30 compliant. If you are using regular/non-Greek yogurt, you can omit the water. This is the wild card, and the point in the recipe where you can put as much or as little effort into it as you want to. Personally, life with an infant is demanding and in the interest of full disclosure, I’ll tell you that I use store bought Tandoori paste every. single. time. No shame! This is the brand I like, since many others contain added sugar. I think they also make a mild flavored version, if you don’t like too much spiciness. 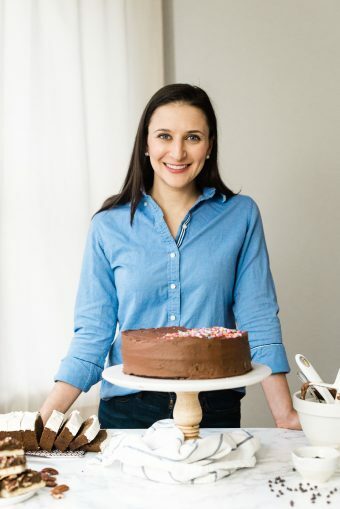 In my pre-baby days, I used to love making things like this from scratch so if you are looking for a mini project, you can find plenty of reliable from-scratch recipes via Google. *PS: Please don’t be scared away by the marinating time. If all you have is an hour, marinate it for an hour. But if you have time, make it a couple of days ahead of time, stash it in the back of the fridge, and pull it out when you’re ready to fire up the grill. Because it thrives with a day or two of marinating time, this dish makes a fantastic meal prep choice. Put the yogurt, water, and tandoori paste into a large (gallon) zip top bag. Seal and massage to thoroughly mix the ingredients. Add the chicken breasts to the bag. Seal and once again massage to make sure that all of the breasts are well coated with the marinade. Place the bag in the fridge for at least an hour, or up to 3 days. When ready to cook the chicken, preheat your grill. Remove the breasts from the bag and place on the grill. Discard the bag and remaining yogurt marinade. Toss the vegetables with oil or brush both sides of each slice. Place them on the preheated grill and sprinkle with salt and pepper. 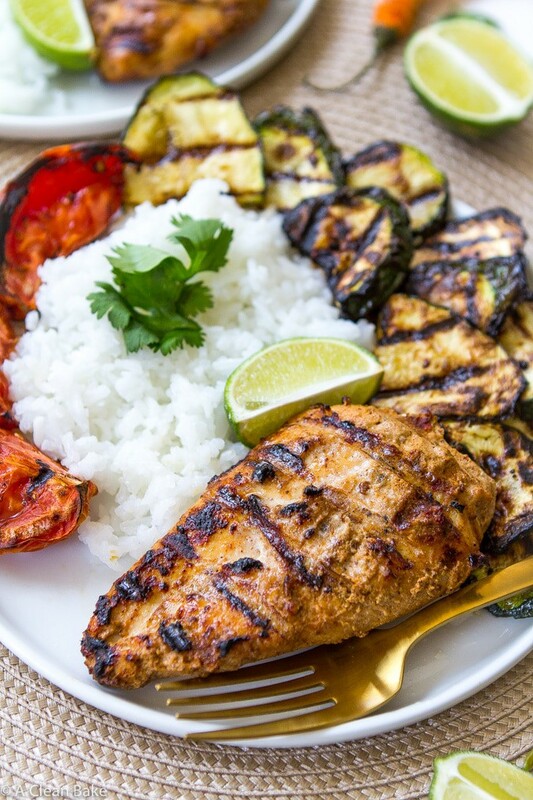 Cook until vegetables are softened and lightly charred, and chicken is cooked through. Serve immediately alongside rice, with a lime wedge (to squeeze over the rice and chicken) and sprinkle of fresh cilantro, if desired. I strongly suggest using chicken breast for this recipe, but if you can't stand it and prefer thighs, give it a shot. 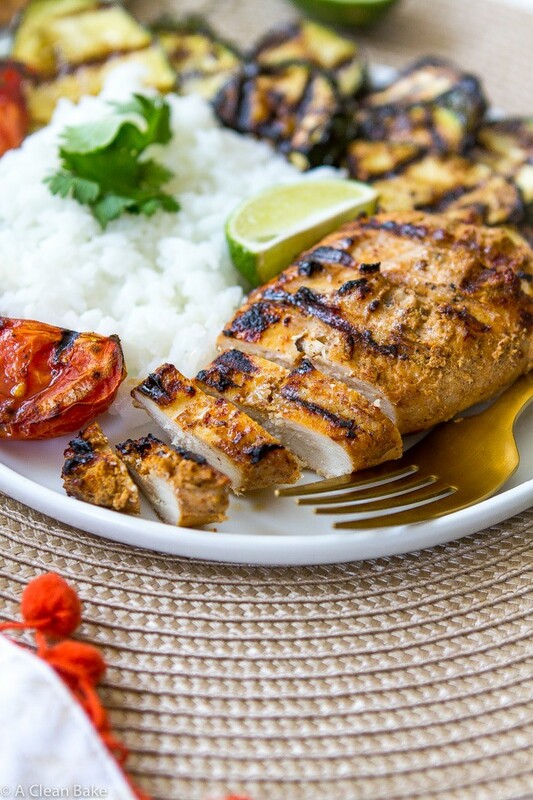 Chicken breast holds up well both to long-term marinating and to grilling and its leanness is well balanced by the tenderizing qualities of the yogurt. I used full fat Greek (lactose) yogurt in this, but you can certainly try a non-dairy yogurt if you don't tolerate dairy. 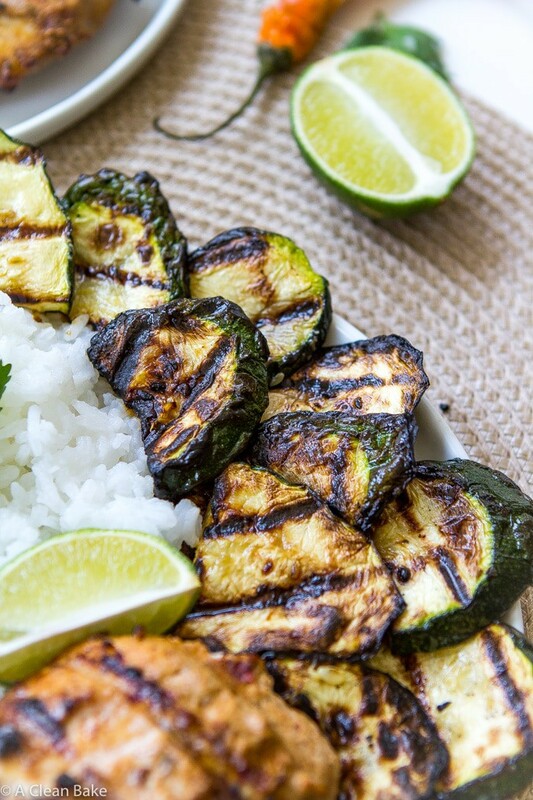 You'll also need to use a dairy free yogurt to make this dish Whole30 compliant. If you are using regular/non-Greek yogurt, you can omit the water. You can use whatever store-bought tandoori paste you can find, or make your own, if you prefer (Google for a recipe). Please don't be scared away by the marinating time. If all you have is an hour, marinate it for an hour. But if you have time, make it a couple of days ahead of time, stash it in the back of the fridge, and pull it out when you're ready to fire up the grill. Because it thrives with a day or two of marinating time, this dish makes a fantastic meal prep choice. If you don't have a grill, you can cook the chicken in a grill pan (or regular pan) on the stove. Click here for instructions on making your rice in the slow cooker. Click here for the coconut rice recipe. Note: nutrition information does not include rice. Thank you to Just BARE chicken for sponsoring this post.